1. 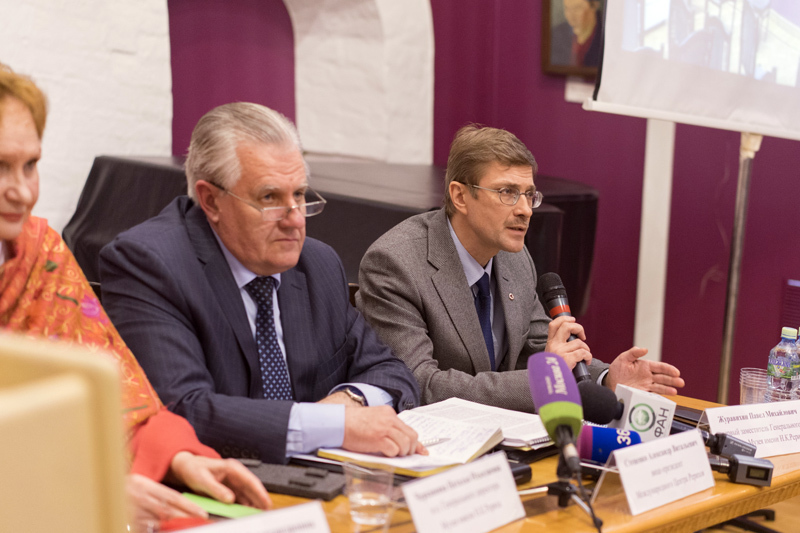 Alexander V. Stetsenko – vice-president of the ICR. 2. Anatoly E. Karpov – the Chairman of the Board of Trustees of the ICR, chess grandmaster, world chess champion. 3. 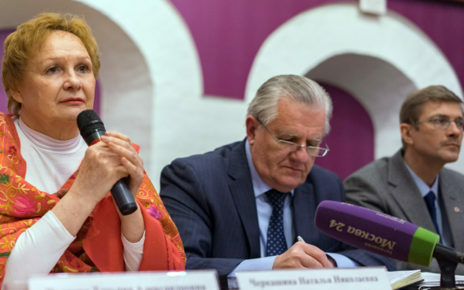 Natalia N. Cherkashina – acting Director General of the Museum named after Nicholas Roerich. 4. Pavel M. Zhuravikhin – first Deputy Director General of the Museum named after Nicholas Roerich. 5. Tatiana A. Ivanova – secretary of the Board of the ICR. 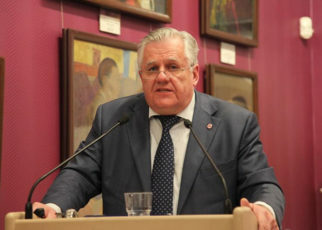 Vice-president of the International Centre of the Roerichs. On behalf of the administration of the International Centre of the Roerichs, Non-governmental Museum named after Nicholas Roerich and all staff of the Centre I would like to welcome you to our Museum. We are starting the press conference. Taking into account that that there is currently no spokesman at the ICR, my colleagues and I, Vice President of the International Centre of the Roerichs Alexander Stetsenko, Acting Director General of the Museum Natalia Cherkashina, First Deputy Director General of the Museum Pavel Juravikhin, member of the Board of the International Centre of the Roerichs Tatiana Ivanova. I will not introduce those who promised to come until they are here.Therefore, what happened yesterday and the day before yesterday. 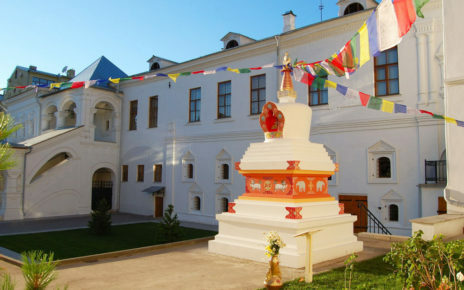 In our opinion, on 7 March from 9.40 a.m. to 5.00 a.m. on 8 March there was an armed seizure of the Lopoukhins’ estate and the Museum named after Nicholas Roerich undertaken by investigating authorities and representatives of the Ministry of Culture on the pretext of investigatory actions related to the criminal case of “Master Bank”. Taking into account all the circumstances and how it all was done, I am going to tell about it, while my colleagues will add some details. I believe that I have every right to say what I have just said: the Museum situated in the center of the capital, not far from Kremlin, was seized. This has dealt a serious blow to the image of our Motherland and to culture on the whole. 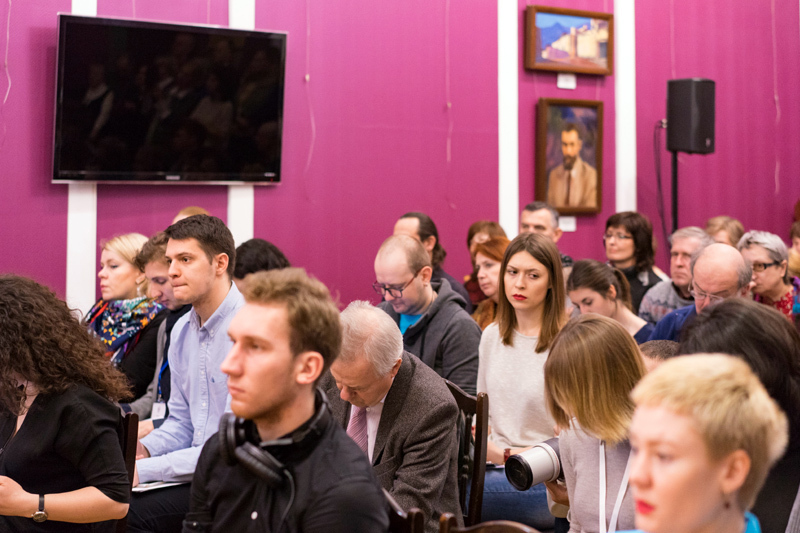 One author has recently published an article in his blog entitled “The 7th March is a dark day for the Russian culture”.Certainly, there was enough time to analyze everything after all that happened. It turns out to be an interesting situation. During three years after new officials were appointed to the Ministry of Culture, there have already been some attempts (which have been practically realized) to institute criminal proceedings against our organization. One of them was in 2014, when criminal proceedings were instituted for ostensibly illegal restoration of the Lopoukhins’ estate and for building a wall on the ground. I will not go into details but I will answer the questions if there are some. At that time investigators arrived in order to check and seize documents. That is how it works: they informed us, arrived and we met them. They let us familiarize with the search warrant and we voluntarily provided documents, which the investigators were interested in, despite the fact that they also came with OMON (Special Purpose Mobility Unit).We provided all documents willingly. They took a look, made copies of some documents and left. By the way, this criminal case has not been dismissed yet. However, actions of 7 March not only violate the legislation but they are contrary some ordinary notions as well. A member of our Museum called me in the morning around 7.30 a.m. and said “an investigator, representative of the Investigative Committee, arrived, served a summons, according to which I was supposed to come to the Museum by 9 a.m. There was an address: 3/5 Maly Znamensky. I saw your name in one of the summons. It seems that they might visit you soon”. Well, I was waiting but nobody came. It was 9 a.m. and still none came. I went by car in order to arrive as soon as possible. At 9.30 a.m. I left for the International Centre of the Roerichs. And then I got a call “Mr. Stetsenko, armed special armed units (OMON) wearing masks has broken in, there are about 60 people, representatives of the Ministry of Culture among them together with Adviser to the Minister of Culture Kirill Rybak, Deputy Director of the State Museum of Oriental Art Tigran Mkrtychev and other staff”. I asked to pass the phone to the senior, “let them wait for me”. Near the Centre I got stuck in a traffic jam, within 15 or 20-minute drive from the Belorussian station. Some time later Natalia Cherkashina called me “they won’t listen to anyone; they are going to break the doors”. Once again I asked to wait for me “I am the Vice President of the International Centre of the Roerichs and, according to articles of incorporation and laws of the Russian Federation, I am responsible for the organization”. They ought to have waited for me at least for 10-15 minutes. Nothing awful would happen. However, they did not do it and now it is obvious why they acted this way. Therefore, according to the records of our guard service, at 9.40 a.m. about 60 people (one can count more precisely as nobody tried to count at first) entered in seven directions. There were seven groups; among them were investigators from the Investigative Committee, members of Interior Ministry’s Economic-Crimes Department, witness to the search and representatives of the Ministry of Culture. At least 5-6 people in each group, and there were also additional means like OMON. They did not wait. 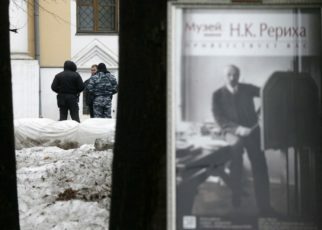 Our Museum, as any Moscow museum, opens at 11 a.m., while the working day of members of the ICR starts at 10 a.m. Those members, who arrived at ICR by that time, entered into the building but were locked there: nobody was let in or out. 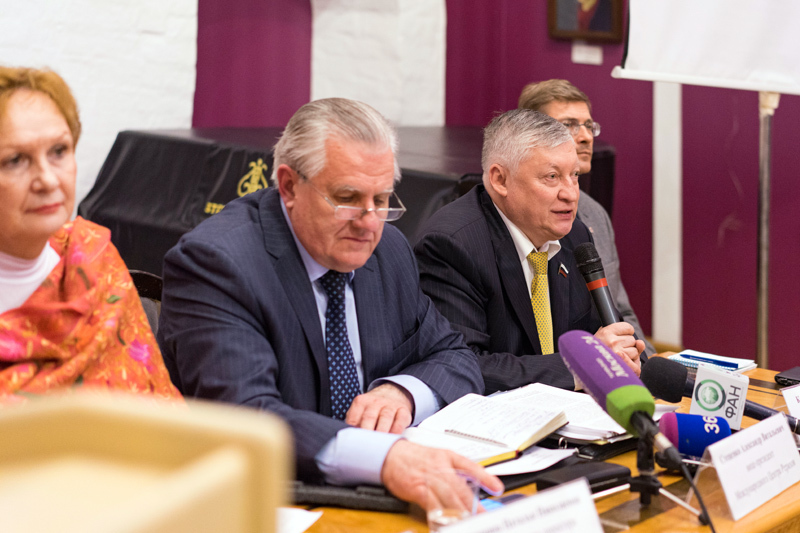 Dear colleagues, I would like to introduce Anatoly Karpov, Chairman of the Board of Trustees of our Museum, who is our old friend, who was also at the origins of the setting up the Non-governmental Museum, he communicated with Svetoslav Roerich many times and knows his wishes and testaments. We thank him a lot for coming to our press conference despite being very busy. Shall we give you the floor, or are we short of time? Ok, I will tell, thank you, Mr. Karpov. Well, I have to repeat some things for Mr. Karpov. 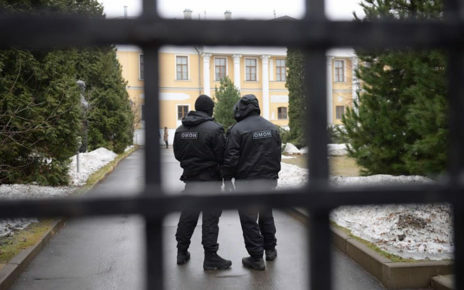 At 9.40 a.m. representatives of the Investigative Committee, members of Interior Ministry’s Economic Crimes Department, representatives of the Ministry of Culture and armed OMON wearing masks entered Museum territory pushing away the guards; they refused to wait for me as the Vice President. They started breaking the door of the Museum using a sledgehammer. 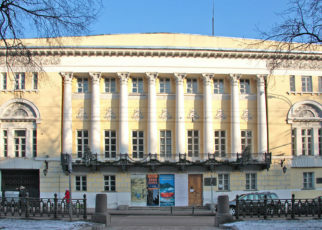 But it is a Museum where in each hall (there are eleven of them) there are cultural values, national heritage of Russia. During investigation museum staff is obliged to be presented. You understand that they did not let in either deputy Director of the Museum or the curators. They left only one representative of ICR guard service, who was sitting in the corner, while they were ruling the tune. Do you understand? It was outrageous! They did not present any documents and did not tell anyone about the rights they had. I have already said that I called attorney of the International Centre of the Roerichs and other attorneys were on the way, they just could wait a little. Nobody would wait. When I arrived at the Centre, around 10.20 a.m., they did not want to let me in. They let me in only when they realized that I was the Vice President. An investigator came up to me. And the first thing I saw was an OMON member with an axe, walking from the side of the 5th building. They had been breaking and hacking the locks of our storage facility. At first, they were talking to me in a very impudent manner. I introduced myself and said that our attorney would come soon. They even started to treat me with unwanted familiarity, while asking to read the search warrant. I asked them to wait for some time, “our attorney is coming and then we are going to talk”. After our attorney Anna Razumovskaya arrived, she started familiarizing with the documents, they led us to one of the wing rooms, where there is no chairs and a very small table. I said “Why are you leading us there? I have my own office here, we have Vorontsov hall, and there is enough room for everybody, we will have opportunity to see everything”. They refused. They intentionally did not let us enter the Museum. While Anna Razumovskaya was reading the search warrant, we expressed all our comments and indignation because of such rude attitude towards the staff of the Centre, where 70-80% are women. And all this happens on the eve of 8th March! Only about 3 hours later they let us enter the Museum. I saw that there was no curators in any museum hall. I said “let the curators enter, it is necessary to bring them here, why are you bossing here?” They said “we have the right to”. The indignation had no borders. They invited Natalia Cherkashina, talked to her and did not let her stay. Only one museum guard, who was not competent, was allowed to stay. Especially without any support from our attorney. We were brought from the Museum to the administrative building, where the search was in process. “Mr. Stetsenko, follow us, we are going to examine your offices”. They made us leave the halls and made the representative of the guard service sign search and seizure record. It is obvious, that he did not know what was necessary to write down, he did not know that it was necessary to point out all violations, all remarks, isn’t it? Moreover, when our attorney asked to wait, she was simply debarred. I believe that colleagues will add something. I did not know, what the investigators are looking for. It turned out that there were seven groups and for each group they chose a representative of our organization, who would be present during the search of certain room. We were in the wing, when they asked me “who will be the representative? It is necessary to conduct a search in all rooms”. I said “Wait, it is accounts department, we need its representative, and we need chief accountant, as documents are kept here”. They said no. They did not let anyone in. I had to appoint as representatives during the search the staff blocked on the stairs. It lasted until lunchtime. It is necessary to repeat that there were no representatives of our organization in the Museum. About 15 members of the Investigative Committee and Interior Ministry’s Economic Crimes Department stayed in this hall. All entrances were guarded by OMON. They took away my phone several times and did not let me either make or receive phone calls. They told me not to go out and to remain there as they restricted movement. Fortunately, I managed to go out and to give a short interview, as journalists had already been near the fence and nobody was allowed to enter. At the same time Advisor of the Minister of Culture Konstantin Rybak and Mr. Mkrtychev were bossing here. For some reason they were introduced to us as experts. And it is even more interesting that one expert Dmitry Popov was invited from the New York Roerich Museum. They were walking through the halls pointing at paintings: “Well, we are taking this painting”. And everything had already been packed. I asked how they had packed paintings without us and how we could know, which values had been removed. They answered that they had pinned marks. You know, it was an endless indignation. They said “Mr. 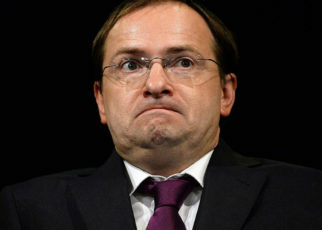 Stetsenko, we confine you”. They accused me of rudeness etc. Even now I am filled with emotions of the arbitrariness, which took place here. I will not go into details about what was going on in other offices. The investigators conducting the search in the administrative part of the buildings were calm and polite. Our attorney and I opened the safes and showed the documents; they familiarized with all of them, asked to copy some documents and we did it. In other words, there was adequate communication. All this took place before 3 p.m. Then investigator Ms. Zaytseva, who guided the process, if I am not mistaking, asked me to come up. She is criminal investigator on the “Master Bank” case. She said “Mr. Stetsenko, why are you…”, while I saw that for some reason she took original documents on donation of Nicholas Roerich’s paintings to the International Centre of the Roerichs dated 2002 etc. She asked me why we had not presented these documents during investigatory actions on “Master Bank“ criminal case (it was in 2014). I said that if I was not mistaking, it was possible to find those documents; at that time they had presented us a search warrant where it had been written that the search was conducted on the basis of the certain criminal case within certain time-frames, 2011-2013 and we presented all the documents to the investigator, while that day she was showing us documents dated 2002, 2003. I was told that we bought these paintings illegally, spending stolen funds. I answered “Has anyone proved that those funds had been stolen? The investigation is ongoing“. She repeated that everything was bought for stolen funds. I wondered whether there was a court judgement. The documents were dated 2002, 2003, 2005, while the license of “Master bank“ was revoked in 2013. I know that, according to the investigators, a loan provided to someone in order to buy the paintings has not been repaid. Thus, I explained it to Ms. Zaytseva but she said that they were going to seize other paintings as well. Our attorney came up and asked to reread the search and seizure warrant. There were mentioned the criminal case and time-frames, i.e. the time period, 2011 and, if I am not mistaking, 2013. I am telling from memory. Alexander V. Stetsenko:2010? Well, it means the period from 2010 to 2013. We could somehow imagine that the investigators were interested in this very periods and donations of Mr. Bulochnik. However, you are trying to seize other paintings as well. The investigator answered “yes, I think that they are related to it. They were acquired illegally“. On what grounds? Boris Bulochnik case is a separate topic; I will mention it if there are questions. In addition, I would like to make it clear. Relations of ICR and “Master Bank“ consisted only in one type of relations: our organizations had its official bank accounts there, which also disappeared after the license of the bank was revoked. Prosecutor’s Office was interested in our relations, while there was no relations with “Master Bank“. Our attorney and the lawyer were the witnesses, and we, from my point of view, guided all this arbitrariness. We expressed our displeasure. We waited. And the second round of seizure lasted until 5 a.m. Here I personally saw Mr. Mkrtychev and Mr. Rybak bossing, while the Museum staff was bringing the items in and out, packing them… “So, unhook this one and this… Such a pity! They do not have the original painting by Nicholas Roerich here, we do not need this“ – these are the words of Deputy Director of SMOA Mr. Mkrtychev. I said “Well, good fellows, of course you do not need it“. I repeat once again: in my opinion, it was initiated by the Ministry of Culture only, under the cover of criminal investigation on “Master Bank“ case. The staff was blocked until 5 a.m. Nobody was interested whether the staff was fed, whether they felt well; perhaps they spent the night on the chairs. It was 8 March, you know what I mean. Nevertheless, a car with pizza, sandwiches and water arrived for the investigators. There is no doubt that it is outrageous. I would like to sum up. Why did it happen? You know, it is not a secret; there is a lot of information on our websites. The International Centre of the Roerich’s and its Non-governmental Museum have been carrying out broad cultural activity aimed at promotion of the Roerichs“ cultural heritage for more than 25 years. 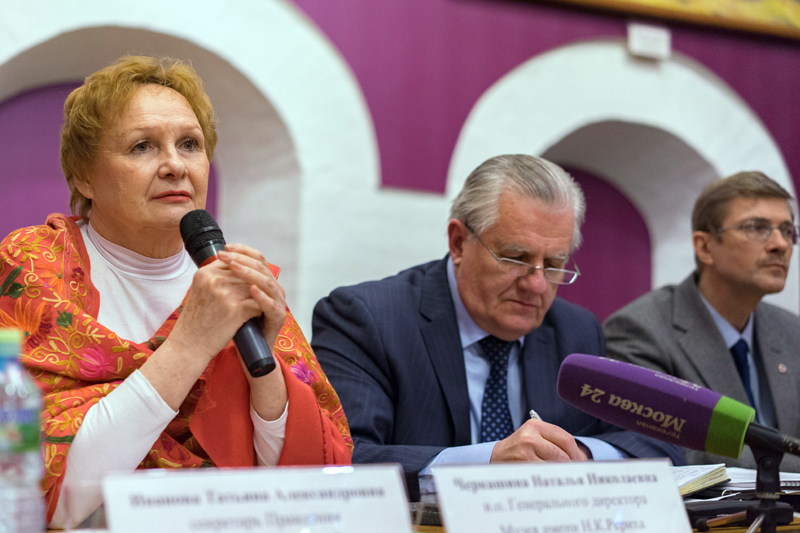 Our leader Lyudmila Shaposhnikova, who was Svetoslav Roerich’s trusted person, Director General of the Museum, who practically created all this beauty, renovated the estate, was awarded by the State several times for her selfless activity. She was awarded twice under Presidential decree, first, with the Order of Friendship and in 2011 with the Order of Service to the Fatherland IV Class. ICR was given awards for scientific restoration of this monument, where you are now, several times. There are documents showing the state of the monument at the time of its transfer to us. It was completely ruined. We used to have normal business relations with all Ministers of Culture. There were some disagreements on certain questions but we solved the problems in civilized manner as it is generally accepted. And there has never been such arbitrariness similar to that one started with the appointment of the Minister of Culture Vladimir Medinsky and the First Deputy Minister Mr. Aristarkhov. Since their appointment in 2013 the arbitrariness, which is still going on, has started. I will not go into details, I will just remind of some facts and compare some of them; we have already mentioned a lot. There is no legal basis for seizure of the Roerichs’ heritage; for example, one can file an action in replevin. If the Ministry of Culture thinks that we are illegally holding the property. However, nobody has ever filed such action. How can they file an action? How will the Ministry of Culture prove its rights to inherit the property, which was donated us by its owner, Svetoslav Roerich? There is no way to do it. In 2015 it tried to make the General Prosecutor’s Office and the Prosecutor’s Office of Khamovniky seize the heritage addressing to the court. However, they did not do it, as the members of the Prosecutor’s Office were clever enough not to do it. What did the Ministry of Culture do then? It started discrediting activity of our organization. While in 2015 there were only five unscheduled inspections and two court proceedings, in 2016 there were 17 unscheduled inspections and 13 court proceedings. Can you find another similar arbitrariness in Russia? I believe that there is even no commercial organization that would be treated like that. Our Prime Minister has repeated many times “Stop nightmarizing business!” And our organization is a non-governmental one. One cannot imagine how many letters we sent to the Prime Minister. Not only I but also the President of our organization Yuri Temirkanov (this outstanding person who did not fear to become our President while the organization is facing its hardest times should be mentioned separately) wrote the letters but this resulted in nothing. Moreover, the Ministry of Culture tried to make everyone think that we were an extremist organization. All inspections were initiated by governmental telegrams and letters, I have a large number of them and I can even show them, all of them are signed by the First Deputy Minister of Culture Mr. Aristarkhov. Under the request of the Ministry of Culture, the Ministry of Justice carried out an inspection in order to check whether we were an extremist organization. There was a corresponding document, we were not recognized as an extremist organization but there were some technical mistakes, which we have already corrected. Then the Ministry of Culture started accusing us of extremism addressing complaints and calumny to the Prosecutor’s Office. They initiated inspections carried out by different investigating authorities including the General Prosecutor’s Office and MIA. Mr. Aristarkhov even sent a telegram to the Deputy Minister of Internal Affairs asking to carry out an inspection of ICR, as, according to Mr. Aristarkhov, there were some Ukrainian illegal aliens. Moreover, Mr. Aristarkhov sent telegrams to Federal Service for Environmental, Technological, and Nuclear Supervision, as, according to him, there ostensibly were explosible containers within ICR territory, which were dangerous for the monument. There was an inspection, everything was checked, and we have one of the best fire-extinguishing systems among Moscow museums. Mr. Aristarkhov also addressed letters to the Deputy Minister of Internal Affairs Mr. Vanichkin, asking to inspect ICR and its Director Lyudmila Shaposhnikova for illegal activities. The letter contained calumny on ICR and its Director Lyudmila Shaposhnikova, I will tell in my own words, that ICR was training rebels ready to gather on the Red Square with Molotov cocktails. Can you imagine it? It looks fantastic. Dear media, we have been facing this awful situation for 4 years already. Endless inspections, court proceedings since the death of Lyudmila Shaposhnikova and Evgeni Primakov, who was our old friend and member of our Board of Trustees. Of course, there have already been some actions against us but none has ever tried to accuse the organization in such mean and impudent manner, trying to destroy it. What is the Minister of Culture doing? 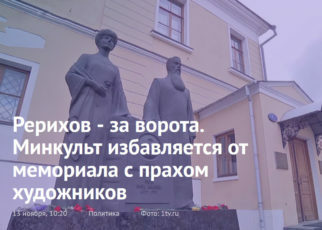 He addressed Sergei Sobyanin asking to transfer the Lopoukhins’ estate into ownership of the Russian Federation, ostensibly aiming to fulfill Svetoslav Roerich’s will but establishing a State museum here in order to collect all Roerichs’ paintings. I do not know why but the document is signed by Mr. Sobyanin. 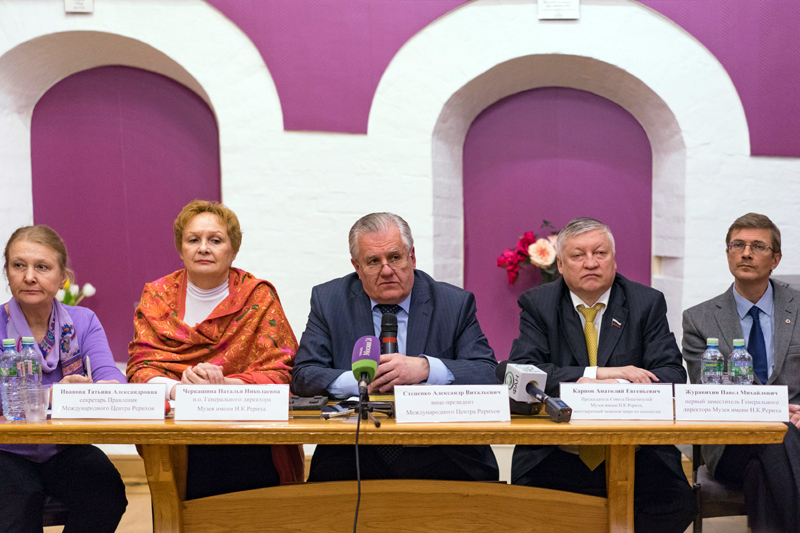 In 2015, several days after the application of the Minister of Culture, all buildings of the Lopoukhins’ estate were transferred to the ownership of Federal Agency for State Property Management. This very Agency together with the State Museum of Oriental Art had been trying to evict our organization from the buildings by means of court proceedings for four years before, which resulted in nothing. 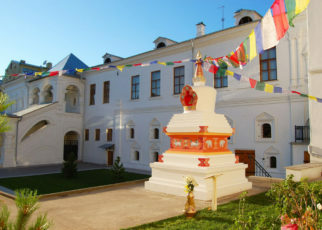 The Federal Agency for State Property Management, under the application of Mr. Aristarkhov, who asked to transfer the Lopoukhins’ estate to operational management of the State Museum of Oriental Art, fulfilled his request despite the fact that the estate was transferred being encumbered with gratuitous use by the International Centre of the Roerichs. We gained this right, as we renovated the estate without any governmental financing. As soon as the State Museum of Oriental Art got the estate, it initiated eviction of ICR from it. Inspections are constantly being initiated, there are also documents describing ostensibly awful condition of the estate, where you are now. Moreover, facts are being falsified, I am ready to prove it being liable to the laws of the Russian Federation, if someone tries to accuse me of calumny. In 2015 Department of Cultural Heritage of Moscow conducted a planned inspection and did not find any violations. Six months later under the request of Mr. Aristarkhov, who said that the estate was in awful condition, Department of Cultural Heritage of Moscow initiated a new inspection, during which the same experts, who conducted the previous inspection, revealed a large number of violations, some of which were simply falsified. Of course, there were some technical defects but on the whole almost all of them are of documentary character i.e. they are related to the documents but not to the condition of the estate. Nevertheless, there were administrative proceedings initiated and the court did not pay any attention to our documents, while the State Museum of Oriental Art referred to it as the ground for our eviction from the Lopoukhins’ estate. Moreover, several months later the Ministry of Culture initiated an inspection conducted by Federal Agency for State Property Management. The inspection took two months, the same violations were detected but in addition it was claimed that 17 commercial organizations were ostensibly registered to the address of the estate. And it is a ground for dissolution of contract for gratuitous use. The state Museum of Oriental Art tried to make use of it immediately. When we learned it, we filed a complaint with the Prosecutor’s Office and the tax office requesting for an investigation. We seized the court and said that the inspections were initiated by interested parties, who wanted to evict us; we asked the court to initiate an independent verification. The court denied our request. At the court we presented the opinion of one of the most well-known honored architects and restorers of the highest qualification. I will not reveal his surname because as soon as the State Museum of Oriental Art learned that we presented his opinion to the court, SMOA raised persecutions on this expert. You know, one can mention many facts. There is no doubt that I will be summoned for questioning after this inspection and seizure. It is also possible that they will be trying to initiate criminal cases against the administration of our organization in order to isolate ICR leadership from the activity of our organization and to appoint external administration. Tax inspection initiated under the request of Mr. Aristarkhov was conducted from April to December 2016 and it was suspended, as far as I remember, four or five times. The inspection did not find any financial violations, however, they said that Mr. Stetsenko (it’s me) was managing financial flows of the organization. They referred to this so-called fact as to the ground for inspection. I said to the taxmen “Please, find those financial flows. The average monthly wage of our staff is 13 000 rubles. Still, people do work”. Finally, in December we were accused of nonpayment of taxes amounting to 52 million of rubles. Why? The grounds consisted in exhibiting of paintings in our Museum. The Ministry of Culture claims that we had not registered a part of collection with non-governmental part of the Museum Fund. What a lie! Among the first museums, in 2004 we registered the entire heritage we had at that time with the non-governmental part of Museum Fund. We were almost the first museum among the State ones who did it. If I am not mistaking, our Certificate of registration with the non-governmental part of Museum Fund is at number 15. Yes, we did not have time to register the latest additions, it is a painstaking work, and they made us a remark. We started preparations for registration but in 2016 the Ministry of Culture did not accept our applications for registration. It is obvious: it was trying to give time to the tax office, so that it would have grounds for accusing us of nonpayment of taxes amounting to 52 million rubles. What does it lead to? It leads to collapse and bankruptcy of our organization. And now the heritage is being forcibly seized with involvement of enforcement structures. Emotions are running high. It was hard to watch how paintings were violently unhooked, packed and sent to the State Museum of Oriental Art. All was done on request. One carrying a painting told me that he did not like Roerich at all. Well, if you do not like Roerich, why do you take his paintings? 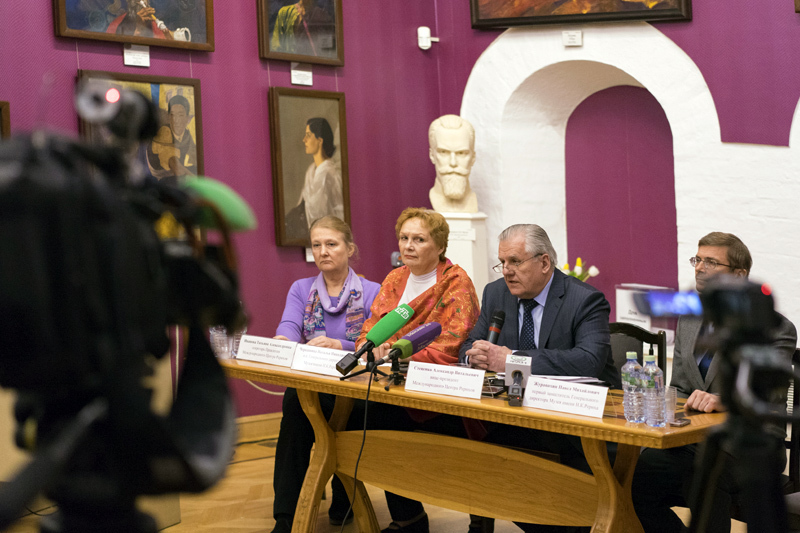 The Ministry of Culture ran a campaign in 2016 under the pretext that the Lopoukhins’ estate had been transferred to the State Museum of Oriental Art in order to establish there a State Museum. There was a meeting of the collegium of the Ministry of Culture organized in February 2016, during which they tried to adopt a decision considering establishment of a State Museum here, in this very building, where our non-governmental Museum has been working for 25 years already. We were not invited to the collegium, and they did not let us say a word. You see, the eviction is based only on these two decisions. Courts reject and do not recognize our claim aimed to cancel the decision of the collegium of the Ministry of Culture. We were told that our interests were not violated. How could that be? There is an obvious violation, as work of all our staff as well as work of a large number of Russian and foreign non-governmental organizations, which took part in creation of the Museum, is not recognized. In fact, the Museum is Russian public good and it was established on request of Svetoslav Roerich. The government accepted his decision, fulfilled Svetoslav Roerich’s requirement considering establishment of the non-governmental Museum and transfer of the estate for the purposes of the non-governmental Museum. Everything is violated now by the Ministry of Culture. We are severely wounded; it is a serious blow to our organization. Nevertheless, you see, the Museum continues its work and will continue working despite all obstacles. What are the Ministry of Culture and its administration striving for? Our organization has no complaints about the Ministry as a governmental body. I will repeat, that there are some people, who are ruling the Ministry, they want to destroy us. They want to establish here a State museum. But wait, how is it possible to establish a new museum destroying the existing one, which has been successfully working for a long time? 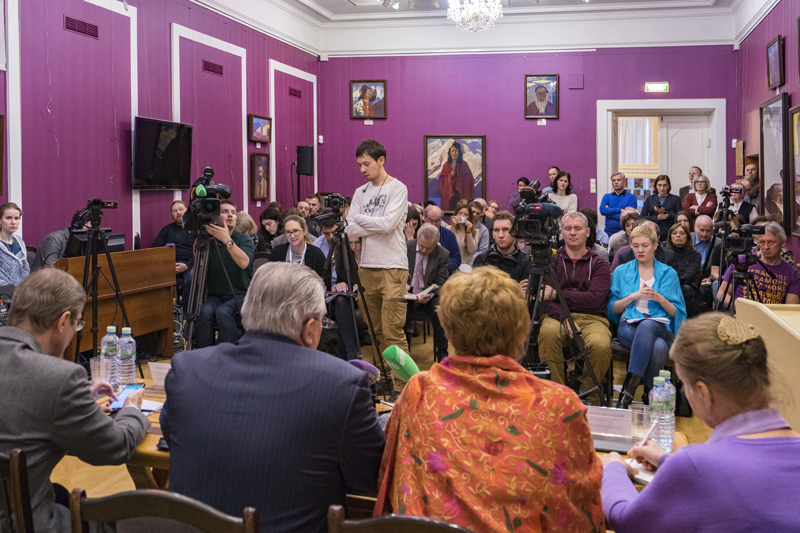 Is it really possible to talk about fulfillment of Svetoslav Roerich’s will, if the Roerichs’ collection, which was kept in Yuri Roerich’s apartment on the Leninsky avenue in the city center, was being looted, taken away and sold during more than 10 years? At the same time government promised to establish a museum. No! How can one talk about love and establishment of a State museum, while a collection, which belongs to Svetoslav Roerich, and which is partially looted now, is kept within the State Museum of Oriental Art? I would like to claim in front of all the media: we do have the evidence proving illegal disappearance of paintings from the State Museum of Oriental Art. Mr. Rybak told me that it was nothing but demagogy. There is no place for demagogy, as the paintings were brought to the USSR in 1978 and we have all acts of acceptance, as well as delivery and acceptance acts from all State museums, where the exhibition took place. Paintings “Snow Maiden,” “Alexander Nevsky” and “The Tale of Shambhala” were included in this collection. How can it be said that these paintings are abroad, included in a private collection, referring to a handwritten note on the act, which had never been confirmed either by the owner or by his representatives? Moreover, one of these paintings is exhibited in the State Museum of Oriental Art, while the State Museum of Oriental Art together with the present Ministry of Culture claim that these paintings have never been brought to the USSR. I am talking about painting named “The Tale of Shambhala”. It was given another name, concealed but it is still exhibited. In 2004 the International Centre of the Roerichs published several articles on this topic, and articles written by me were issued in 2009. We approached the General Prosecutor’s Office and the Investigative Committee, we presented the data but nobody wants to initiate an inspection. Everything goes to the junior ranks and results in the following situation, when an investigator comes to the SMOA and asks whether they have any paintings missing. Of course the answer is “no”. Thus, the investigator notes that there is no grounds for a criminal case. However, it is known that there is a significant difference of 6 paintings between the number of paintings listed in the will and the number, which exists in reality. They refer to Svetoslav Roerich’s letter to the President, where he mentioned 286 paintings and not 288. I agree but it is possible that Svetoslav Roerich made a mistake and I also suggest initiating an open investigation considering this question under public control. They refuse. In addition, the last thing I wanted to mention. It is hard to realize that during these 3-4 years our cultural activity has been disturbed. ICR was carrying out wonderful international non-governmental activity, which is significant and necessary for Russia, which consisted in promotion of Nicholas Roerich’s heritage. During these 2‑3 years ICR organized a vast International exhibition project entitled “The Roerich Pact. History and Modernity,” which took place in 17 countries, including an exhibition at the UN General Assembly in New York. Owing to Vitaly Churkin we realized this significant project. Ban Ki-moon was very impressed by the exhibition and was eager to arrive in Russia, when he was invited to the celebrations dedicated to the 75th Anniversary of the Victory in Great Patriotic War on 9 May. However, he did not have the opportunity to visit our Museum on 9 May, as he had a busy schedule. But we still waited for him at the Museum. On 10 May it was Irina Bokova, Director General of UNESCO, who visited our Museum. She was very impressed by our Museum and left a wonderful note in the guest book. In presence of Valentina Mitrofanova, our representative to Paris at that time, we arranged with Director General of UNESCO to organize a new cultural project “Peace through Culture”. However, the Ministry of Culture ruined everything. We faced economic blockade. Now we know and there is a lot of evidence proving that those who help us face persecution, complaints, and falsified letters about them full of lies. But the Museum does work and will continue to carry out its activity. Well, the last thing I wanted to mention. 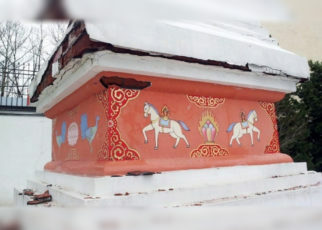 If the Ministry of Culture achieves its aim and the government follows its desire and recognizes that ICR is illegally holding the heritage, transferred to Russia by Svetoslav Roerich for our organization in order to establish our non-governmental Museum, there will be no legal basis for the heritage to be left in Russia. Do you understand it? The Ministry of Culture does not think about it. All destructions, including one, which took place yesterday, are not only a blow to the prestige of the Russian Federation but to its image on the international scale as well. Now Russia is facing hard times. It is a blow to the community and its active work in cultural domain. Our President Vladimir Poutine has mentioned several times and set objectives to the Ministry of Culture to pay attention to non-governmental organizations and to help those of them, which preserve and renovate cultural heritage. “Main Cultural Policy Postulates” were issued. However, the Ministry of Culture is doing the exact opposite towards our organization. And we cannot find protection anywhere. You know, we are running out of patience. We have been sending letters asking for help for more than three years. The governmental authorities do not pay any attention to it. 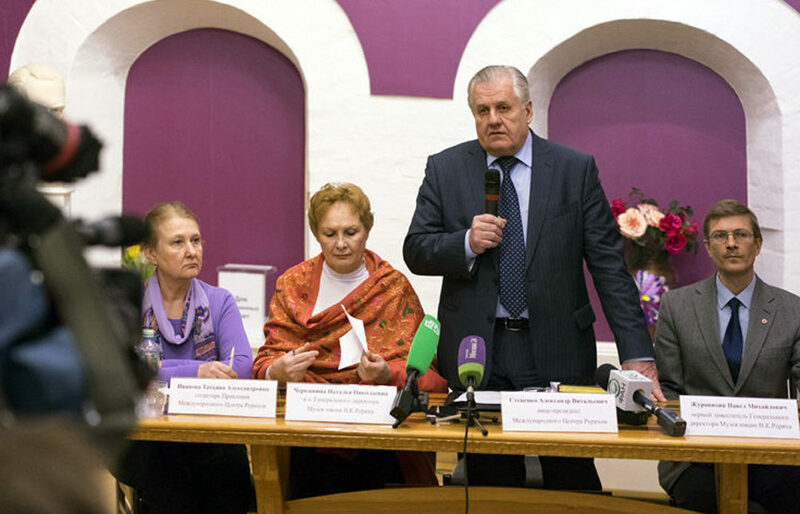 Our international organization does not have any other opportunities but to address international community and to raise some money there in order to pay 52 million rubles of taxes, despite having spent not less than two milliards rubles to renovate the Lopoukhins’ estate. It is cynicism, meanness and humiliation. I thank you for your attention and yield the floor to Anatoly Karpov. The Chairman of the Board of Trustees of the ICR, chess grandmaster, world chess champion. Now, I will comment a little and leave, and you will ask questions. Well, you know, I just wanted to remind you that the whole legacy passed to Russia under the will of Svetoslav Roerich. In fact, even during his lifetime he engaged in talks about bringing the legacy back to Russia, but that time to the Soviet Union. Svetoslav Nikolaevich met with Gorbachev. At that time Gorbachev was the President of the Soviet Union and, thus, an agreement was reached on the fact that the legacy would return to the Soviet Union, which is as it should be. How did I get into this process? Svetoslav Roerich, by meeting with Gorbachev, requested a meeting with the management of the Soviet Peace Fund. And when we first met, he said that he would like it to be a non-governmental museum, not a state museum, when the legacy would return, and, he would like to have not only a political country management as a guarantor, but also one of the largest non-governmental organizations. Then the Soviet Peace Fund had considerable financial resources. And, thus, an agreement was reached, which was approved by the Board of the Soviet Peace Fund, and then by a conference. And all the first actions, including the transfer of legacy, were carried out at the expense of the Soviet Peace Fund, and then, later, of the International Association of Peace Funds. When I met with Svetoslav Roerich, I understood, and he repeatedly said about this, that he did not transfer the legacy to the state, but to Russia, but he was sure that the non-governmental organization would be attentive to the legacy. And, you know in his lifetime he hoped and relied on social forces. Of course there were some problems. We did not get this building at once, we got it in a very bad condition. You can see there, we have photos and you can see the condition of Lopukhins’ estate when we got it, and in what condition it is now. Here, this is a central part, a museum part, and this is an administrative building. This is, of course, a glory. A glory, if we talk about the Roerich’s Teachings, the Roerich legacy, our great compatriot, then there is nothing better in the world, and, by the way, today I learned with surprise that most of the paintings from New York, and there the Roerich Museum exists for a long time, most of the paintings have been sold, but even some part of them have come to us. But, what happened these days, I think was with some legal infringements, they certainly were there. They are connected not only with the order that exists, but with the fact that the law enforcement and justice bodies of Russia occur more rarely, firstly in work with museums. Secondly, they behaved here as if the museum was under criminal investigation, and not some part has come. And, as I understand it, the prosecutor had to sign the warrant on specific paintings, although, frankly, I do not understand how the investigation can prove where the stolen money are, which paintings have been bought with money and transferred to the organization, officially transferred, and where are not stolen money. How can you divide? We can prove, somewhere, Bulochnik took out some kind of loan that he did not pay back. But, did he buy pictures using this loan or maybe he had other personal finances? That is, it will be almost impossible to prove this to the investigation, I’m not talking that the fact has happened. This became the property not of Bulochnik, who is under a criminal procedure now, but this is the property of a non-governmental organization. While I am here, I have remembered that we had a very egregious case, back in the Soviet Union, in 1986. Then the investigating authorities found some philatelic documents which were stolen from the state archives. And the investigation for want of a better response went to the Philatelical Society of the Soviet Union, took a list of the most famous collectors of Moscow, went to a prosecutor of the Kiev district and according to the list of the philatelical society a prosecutor gave permission for search and seizure in all Moscow collectors, philatelists. I know this from Rozov, late, unfortunately, he was a great playwright. I was in that list, but at that moment I was playing a match with Kasparov in Leningrad and, of course, nobody could open my apartment, that’s why I was out of this operation. There were major collectors, they were visited, if we can call them that, by the representatives of the investigative bodies and did seizure, nobody knows what they seized. Rozov simply had a huge chest with a philatelic collection in the center of the work-room. They came and asked: “where do you keep stamps?” He replied – “Here.” That’s all, they took the chest, moreover without any inventory. Well, how to describe stamps? It’s very difficult. Rozov made a terrible row, and in the evening they returned stamps to him with apologies. But, I know collectors whom they did not return and who had losses, and we know who was responsible for this ingenious operation, then some stamps were sold from different collections, so we know who had a hand in it. This reminds me that story, because they came and did not know what to seize. If you have evidence that some paintings were bought for illegal means, then there should be a list of these paintings and as Aleksandr V. Stetsenko said, they should have been seized. They seized, what they seized, today, it is impossible to control it. Because, I think that this is violation of rights of both the museum and the Roerichs Society, there were no representatives, the seizures occurred in an isolated way. There are no investigation, police, museum representatives. And we still do not know what will happen. I do not want to denounce in bad intentions, but the whole procedure is very surprising, that it was possible to come so easily, broke into the museum, twenty minutes before the start of work. Just wait for the personnel and execute this operation with it. Well, in fact, I do not know whether or not there is evidence of this, but only now, we have looked at the TASS report that 47, 54 boxes from the Roerich Museum are stored in the Museum of Oriental Art. And, is the Museum of Oriental Art the Department of Russian Investigation or what? If the paintings have been taken as evidence, then they should be at the investigation, and not in the museum. Now, this is quite an astonishing fact. That is, thus, they are probably trying, at least in part, to take unique works of Roerich to the museum and conduct further actions to evict the organization from these premises. 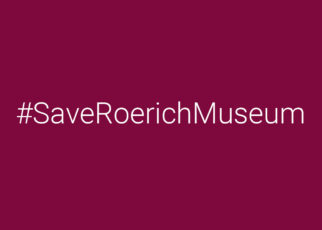 The decision to create a state museum, as they called it, the Museum of the Roerich family, it was made without participation, without the consent of the Roerich Center and the museum’s management. I am also worry the fact that Roerich’s will, the organization created by Roerich in Russia are being questioned, and, then, the legal foundations for this whole unique collection are cease to be effective. And unfortunately the Roerichs do not have legatees on the Russian side, there are legatees in Indian line. And the Roerich family in India can request, demand: “since you disavowed Roerich’s will, then, kindly, return us everything that is in Russia”. Now, this is what we have today, and I think that after all, the common sense will take its toll, and someone will understand what we can finally get. I thank you for your attention, and turn it over to you. Alexander Vitalievich raised legal issues, I want to address the ethics and moral issues which we had to face here. I spoke to the people involved, so to speak, in these investigative actions and that none of the employees has been read out their rights – I do want to confirm it. Next I want to talk about how investigators and the staff of the Ministry of Culture behaved at the Museum. When searches and seizure of documents were finished in the administrative part where I was and I was not allowed out, I naturally first went to the museum because I knew that none of us hadn’t been allowed here. The first part of the painting seizure had ended and what did I see? Perhaps museum staff would understand me – my heart was just bleeding. Everyone walked dressed in street clothes, with bags, suitcases, backpacks and ate in the Museum. At first, I saw it on the ground floor. I asked the staff who were carrying out investigation acts not to eat here by the paintings and go out. No one went out on the ground floor and I was told, literally. “Well, after all we’re not going to the toilet here”. I take full responsibility for these words, unfortunately, I don’t know the names, there were more than 70 people, none of them introduced themselves, they were just making demands, running, grabbing hands, taking away phones. Only those investigators who have conducted searches in the administrative part introduced themselves to me and I have no complaints of their behavior. When I went up to the first floor, I saw the same thing – investigating officers dressed up with bags, rucksacks. But what stunned me most – employees of the Ministry of culture also walked in jackets, coats, with backpacks and bags. They were working dressed in these clothes. These are people who were constantly giving interviews in the media, on television, in newspapers, saying that they care about conservation of art works, especially in our museum. To tell the truth, investigating officers who I had asked to go out and eat on the staircase did so. I have to commend them here. One more thing that I want to say. The searches were also conducted in the repository – it is the holy of holies of the Museum. Just 5 or 6 people are allowed to this storage facility on special orders. Not each employee who works at the Museum has the right to enter there. And for such a case a special permit is issued at the request of the custodian. So, this time over 15 investigators came into the repository and only one custodian who asked them to take off outerwear, cause we have climate control, the air from outside goes through special cleaners, we always put on shoe covers, we don’t lie, when the Ministry inspected us, they did all the same. We were inspected in late 2015 for one month with participation of officials from the Ministry of Culture – Mr. Rybak who was mentioned before and some staff and Mr. Mkrtychev from the Oriental Museum also participated. They checked everything – all the documents, all the items. So, 15 people entered the repository of 4 rooms with one custodian who just could not keep an eye on everything. We have not checked there yet, there are not only paintings but objects of small forms and other various items as well. What we found in the morning, when it was over – there was a roulette from the repository, we just know it cause it’s marked, here on the piano, it means someone took it out of there, and we were looking for a mouse of repository computer, we couldn’t find it anywhere and then found here only by label. They are not art objects, but things have been taken out from the repository and the keeper could not keep track of it. So, what happened at the storage area of 4 small rooms – 15 people went in and spread out on the premises. And she suggested them to open and show everything to keep some kind of order, but the rest were walking around on their own. That is the kind of attitude. Representatives of the investigating authorities said that it was the first time they took part in activities in a museum building, they hadn’t had to do that before. But there are some moral issues. I’ll briefly tell you how they treated our employees. Chief Keeper was woken up at half past seven in the morning. I can give her name, she does mind and can confirm everything, Kupchenko Elena Alekseevna. At half past seven two men came to them, presented summons and said that they had to go with them cause they hadn’t appear for interrogation. She said, “I haven’t received anything”. They said, “Sign here, sign this document that you haven’t come for interrogation.” She said, “I’m not going to sign, I haven’t got any summons”. “Then get dressed and go with us’ … and they say nothing to where, or why, or how. Then I called her and asked to clarify where she was being taken – the address was told –3/5 Maly Znamensky lane. We realized that she was being taken to the Museum. She was got out of the bed at seven-thirty in the morning and, without any cup of tea, was literally brought here. She did not eat, did not drink till 5 am of the next day, and was let to the toilet under supervision, when she said she needed to go out, she was told to stay. She was brought to the toilet. Is she guilty, don’t we have a presumption of innocence? Another example. Old ladies, we call them so, women at the age of 70 or so who work as museum keepers, they are a few, they came to work and were not allowed. They were taken to the side wing and sat on the chair and that we saw when we were allowed to look in? – they were sitting with their handbags dressed up and eating what they brought with them. They were taken to the toilet by a representative of the Special Police Force or investigators, who waited for them and brought them back and they drank water there. Such was the treatment of our employees. One very fragile woman working at the department of accounting and archives was just pushed by an investigator. She said, what if I pushed you, or broke your glasses? One employee who was brought here when he said to the staff who were there not to sign anything and wait for our management, they twisted his hands and when he started shouting, they said shut up, does it hurt that much, and dragged him to the archives, put him and the security guard face to the wall and forced to raise their hands, and they were standing like that. The people who work here, none of us is under investigation. I’m telling you about that treatment. Another example, perhaps the last one, why we are so outraged. One woman in charge of the economy somehow went out. We have keepers’ room at the side wing, and she wanted to go to it. She was lightly dressed, and they closed the door in front of her, she was not allowed in the museum or the keepers’ rooms, she stayed outside lightly dressed till 4 am. She is here if you want to see her. And we need to pay tribute to the security guard in the booth (it is our guard), who let her in there to get warm. It was only at 4 o’clock in the morning when she was allowed to come in here and take her jacket. This is what we have experienced here during these investigative actions. The investigators told me that they had never faced such resistance to the authorities as they were having here. But if I do not want to sign anything, if I ask to wait for a lawyer and the manager, I have that right. As they say, you have the right to remain silent and call a lawyer. And I call a lawyer using speakerphone and the lawyer says, “I’ll be right there”, and my head says on the speakerphone that he will be now, that he is late. They don’t pay attention to all this. I was cut off from the Museum, they wouldn’t let me go out, I tell them, “I am responsible for the Museum, I am responsible for the painting, these are my job duties, first of all. In the evening they called me here, it was one or two am, I was called here, cause they didn’t know how to turn on the lights in the halls. They brought me here, OMON let me in, then they told me to get out of here, they can do now without your help. I tell them, I’m not a girl, can’t I stay here? – We are gonna take you out of here with OMON. And they took me away under my hands, and said that I was interfering with the investigation. I asked in which way? I can help the investigation, to tell how to turn on, turn off, where which paintings are. – You are interfering with the investigation, leave. – Why, I’m responsible for it … I’m not doing anything. They called OMON. A poor police officer standing doesn’t know what to do with me – I’ll have to take your arm and out of here. I was taken out. And they make claims for disobedience to the investigating authorities. Everyone says that it is so critical to conserve works of art, and we do not conserve them. What have they done to some our works of art that were taken from the repository and here from the halls, we probably can not say that. Restorers say that they can not be rolled, otherwise their colorful cover of paint and varnish will be damaged greatly. This didn’t ask us about this. We were not allowed in, no one was interested, they have rolled and carried them away. Those works of art it may be restored at best. That is about the respect for the works of art and how those who want us to take them from us care. I am full of emotions here. 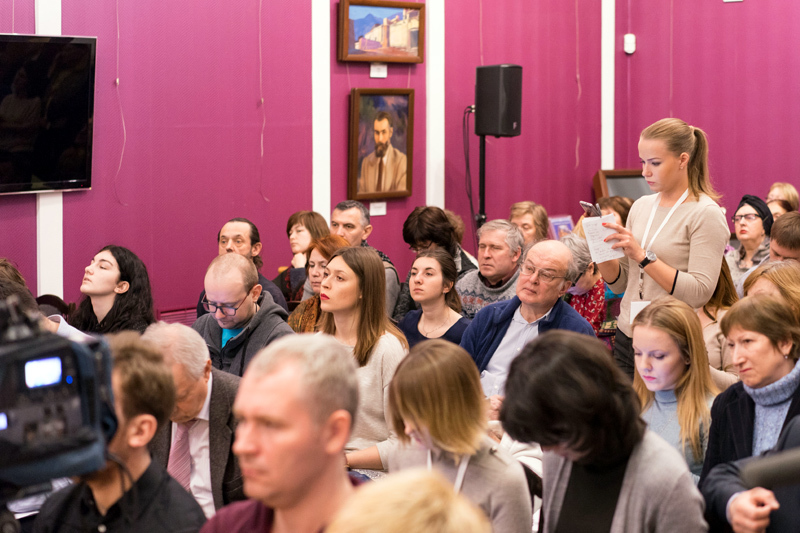 A question from the audience – how many paintings did your sponsor Bulochnik donate you and if talking about money, then what is their value? Statement 2 – Natalia N. Cherkashina (Recording time: 1 hour 29 min. 18 sec.). We know the approximate number of paintings that Boris Ilyich donated to our Museum since 2005, all documents are available, about 30 paintings. But there were donations before 2005 as well. Statement 3 – Natalia N. Cherkashina (Recording time: 1 hour 44 min. 35 sec.). I want to clarify it, you know, what the situation now is very interesting. We have been inspected by the tax authorities and part of the original contracts have been seized, but they confirmed it all, left copies of contracts on donation of Boris Ilyich, but this time not only the originals of the contract were seized, but the copies as well. We are basically left without any documents on the paintings, you see? And then our personnel started asking to let them make copies. They were allowed to make some but then were told it was going to take a very long time, there was no time to wait, so come to us to the investigating authorities, claim what you need and make copies. Thus, the Museum is actually left without documents. Speech 4 – Channel 360, a question – is the announced intention to sell the paintings serious and what is the future of the paintings? Statement 4 – Natalia N. Cherkashina (Recording time: from 1 hour 50 min. 25 sec.). We can not know the future of the paintings, anything can happen to them. What we do know now, is that they were taken to the to the vaults of the Museum of Oriental Artt. They are under investigation, they act as material evidence. Where will these pictures stay? we assume that in the Oriental Museum, but we can be disapproved, the investigations are still being conducted. We assume that these pictures will remain in the Museum of Oriental Art, and for this they have been seized, this museum representative walked around here, looked and pointed out which picture to take, for that purpose he looked through the original documents seized from the accounting department and copies of these documents. Here at this table the representative of the Oriental Museum was sitting, watching and saying – we need this, we don’t need that, we are interested in it, it does not interest us. This is what I could see, and then they took me out. The paintings seized were not those stated by the investigating authorities representatives, but those pointed out by employees of the Museum of Oriental Art. How can we understand it? Do the staff of the Museum of Oriental Art know about the investigation procedures? Were they let to know of the criminal case? Do they know all the details? I don’t think so. All the more, the second seizure .. if when the first seizure was – they showed me the list, there were 11 or 13 pictures. I was shown the list, I remember the number and some of the paintings. There was a list of paintings to be seized, but they were only 11-13 paintings, no more. The rest were seized, I don’t know how to call it .. at the behest of volition of employees of the Ministry of Culture and the Museum of Oriental Art. First Deputy Director General of the Museum named after Nicholas Roerich. I will try to be brief. 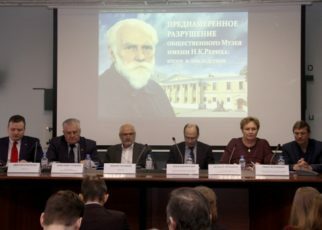 On continuation of the speech by Natalia N.Cherkashina I wish first of all to say that Museum named after Nicholas Roerich is the unique serious museum in Russia with the biggest team of specialists on study, research and popularization of the Roerichs’ heritage. The experts here are exceptional and outstanding. These experts are the rarity and have 15-20 years of work service. Neither Museum of Oriental Art, nor Roerich Museum in New York or any other museums have such high-level specialists. We have the largest Roerichs’ archive and we publish more than 200 editions. We have the biggest collection of art pieces, Roerichs’ paintings, which we have been compiling for over 25 years. It is not only the heritage transferred by Svetoslav Roerich but also by the donators from the whole world. They thought that their art works would be in safety and transferred them to the museum for perpetual storage, returned hundreds of paintings, including Boris Bulochnik, from global auctions, all of them were returned to Russia. And it is unfair when we see such an attitude towards the unique world-class experts of who we can justifiably take pride, as it is impossible to simply educate these experts, we can do this only during direct engagement with the art pieces and it needs constant years of work to educate these experts. They were literally stepped on, as Natalia Cherkashina said how our experts were seating on chairs in the passage of the hallway like the homeless people and everyone who wanted was passing by them. That is the way they treated with our workers. Natalia Cherkashina and I were the first who met these 60-70 people, some of them immediately came to us and began yelling: “Quickly put all the documents on the table!” We answered: “We are sorry but our head will soon arrive and then we will open all the doors and give you everything you want”. We saw that those people went along the museum with a huge cutter. I told the investigator: “I am sorry but why do you want to hack the museum? We have 10 minutes”. In his presence I phoned Alexander Stetsenko, our head. The investigator answered: “Well, we will wait”. At that moment the doors of the museum have been cut. Shortly afterwards I asked “Do you anyway understand what you are doing?” Russia and may be the whole international practice didn’t see how the museum is being forced beating out the doors. It is nonsense. It is a shame for Russia and will be a stigma on the Russian culture. That is how the Ministry of Culture relates to its cultural heritage. The artist Roerich is a world figure, a great Russian painter. At that moment they understood what they had done. They said: “Yes, guys, we hurried up”. As you see, the guys hurried up. To tell nothing about that I was also blocked but I had to be some time here at the museum. When I came, the half of paintings was packed. What happened? Alexander Stetsenko arrived, we were outside and I saw that packaging materials were brought to the museum. I asked the guard form Special Police Force (OMON): “What is this?” – “They are packing the paintings” I said: “How is it possible? There is no museum worker in the halls. Who is packing? Unknown people remove paintings and pack them” – “All right. Everything is fine. They are specialists”. And when I managed to come there over an hour I said: “What are you doing here without our workers?” Suddenly they understood. “Well, come here and sit down”. I came here, half of paintings were packed. I said: “How will we sign up in the protocols if we do not see these paintings?” “We will not unpack them so you must sign “as is”. Of course I did not sign anything. They made our guard underwrite there when I was taken away. It was a chaos, horrible situation, some kind of surrealism. Then I told the investigator: “Fine. You think these paintings were purchased on stolen money. You are removing these paintings now. What next? You want to return money to the depositors. What will you do?” The investigator answered: “We will auction them”. I said: “Are you crazy? They were returned here from the whole world, it is a private collection, and millions of dollars were spent including Boris Bulochnik who attracted funds to return them to Russia” “We do not think about it. The depositors will suffer”. As you know, last year we opened the exhibition “The Roerich Pact. History and Modernity” in Washington. I was in Washington. Despite sanctions the American citizens accepted us, they understood that culture is the soft diplomatic force, culture is the force that can open up the obstacles. State officials cannot enter the country but our non-governmental peacekeeping organization saying about the Roerichs’ heritage, his peacekeeping activity on preservation of heritage and cultural treasure of the humanity was allowed to enter. We were in the National Gallery in Washington. There one can see paintings which the Soviet Union sold from Hermitage in 1929-1934. These paintings are famous – Rafael, Rubens, Titian. Now we measure it was done to get the money and feed people. They did not feed the people but left a mark in history. Now we see it as a nationwide crime. The same things happen now. I saw the nameplates on the paintings in Washington National Gallery: “Donated by the foundation”, “donated by the patron”. By the way, American patrons bought out these paintings and presented to people. Each businessman is honored to donate the painting to the museum for the people. Some of these patrons were ruined, but no one came to mind to take off and sell the paintings. This year marks the 100th anniversary of the Russian revolution, what are we doing? The representative of Ministry of Culture was here all the time. They cowardly told the mass media: “Ministry of Culture is not relevant to it”. It is a lie that “Ministry of Culture is not relevant to it”. Museum of Oriental Art declared: “We have nothing to do with the incident”. It is also a total lie. They saw what happened with the unique work team and did not do anything to help. They kept silence and only said: “Here, here, here”. They only clicked the lists searching what to take away. Certainly it is the highest degree of immorality. This suggests that culture is being destroyed and destroyed by people who are not relevant to culture. Mr. Aristarkhov for 7 or 8 years has been working in construction business, the man who pushes around us as it was said earlier. But now this man who does not have any special education is responsible for preservation of cultural heritage of Russia. The way how he is responsible is clear– as you see, there are only cables of paintings on the walls. I will take a few minutes more. Yesterday we opened the museum for the first time for everyone who wants to come and see what happened here. We took interviews. We were curious about the reaction of people. It seems to me that it will be interesting to hear. Turn on the screen. Please. You know, it is the second message for the short period of time. What you said was really discovered. They were found in the museum as they suddenly resurfaced and were not discovered here. Actually they were in exposition and suddenly detected such an interest to Roerich. Before that it was said that about 10 previously unknown paintings were found in Croatia. But what surprised me – that Russian diplomats are negotiating on the return to native land. And here you see that it is referred to sale. Nicholas Roerich held exhibitions and he really did them before the World War I and donated paintings to collections, including the Museum of Russian Art in Prague, Croatia. There are indications for temporary storage but no accurate estimate is known. I do not have any accurate results. He donated several paintings to Paris, it is a well-known practice, and to the Pope. No one was engaged in it. Russia did not need Roerich. That is all. But now it is a sensation for them. One more example. You asked where we take the money now. The principled position of the Roerichs and Nicholas Roerich was that culture must remain in the public domain and under public control. Roerich personally organized a number of cultural institutions, the public institutions. Svetoslav Roerich maintained the position of his father so he created this museum on a voluntary basis. Now we exist only due to our own earned money, the museum is working, thanks to donations of a great number of people, because thousands of people and volunteers took part in establishment of this museum. Thousands of people from the area of the former Soviet Union really donated money. Now we live the same way. Thanks to donations and aid of volunteers. Ilya Shablinsky A member of a Council under the President of the Russian Federation on the human rights and the civil society development. I suppose that the Council would like to develop a clear position on this problem. For now, I believe, it is only being formulated. Our chairman Mikhail Aleksandrovich Fedotov talked to Alekseyeva about this. I have two questions to clarify. First, some words on my understanding of this problem now. Just a few words, very preliminary assessment. The fact is, as I understand, that the International Centre of the Roerichs is the biggest non-governmental Museum, in Russia there is no bigger one. There are quite many small museums, we described their activity, they are scattered all over Russia – a museum of mouse, a museum of vodka, very small, almost tiny museums and they do not have any troubles. And to such phenomenon as a non-governmental Museum our cultural environment is still not accustomed. As for the question by a journalist of the “Komsomolskaya Pravda” – “whom the Museum funds belong, whom the Centre belongs”. Colleagues, The Tretyakov gallery was a private museum, and almost all biggest museums in Europe were initially private, non-governmental museums. We have a determined position on what Mr. Stetsenko said. We need social activity in this sphere and for now this activity is minimal. I.e. the tradition was interrupted in 1917, and there were no non-governmental museums until the end of 1990-ies. Further, the legal side of the issue. I still do not know all the details and would like to avoid categorical statements, but usually in a constitutional state a property of a patron of art, a property of a particular individual or a legal entity and a property of an organization that was the object of charity, are separated. These are two different subjects. Constitutional state separates them and this is a well-known old problem, but it is like this only if we speak about a constitutional state. But such difference exists, and, I assure you, is known for a very long time. I would pay attention to Anatoly Evgen’evich Karpov’s words, he described the situation very well. Svyatoslav Roerich saw his Museum as a non-governmental organization. I have read a lot about it, as Lyudmila Mikhajlovna asked me to. He knew that the state treated his heritage coldly for quite a long time, did not want to acknowledge Roerich. The Russian state, the Soviet state did not want to know him. And he knew that the state can change its tastes, preferences. How many ministers, so many are the points of view. This position of Svyatoslav Roerich is not occasional and it is good that Anatoly Evgen’evich pointed attention to it. The Roerichs heritage consists of not only more than thousand pieces of art and paintings, it is a certain blend of philosophical traditions, to which people may have different attitude, that is what we are facing. Within some of them it causes irritation. In this I see the reason of such behavior towards the Museum. But I emphasize once again, that our Council is a non-governmental organization too, though under the President. We will try to formulate our concern and, of course, would like to help this situation. From a common humanitarian point of view this is a very strange union – The Ministry of culture and OMON, but we have already met this, so it is familiar. And I wanted to clarify two things. It was said, and I need to know precisely, is it true that not only the originals, but also the copies of the deed on the works of art were taken away from you?Alexander V. Stetsenko. Absolutely right, we are left now without any documents that confirm the legitimacy of location of the collection in our Museum. That’s what they made.Ilya Shablinsky. And you can visit the investigation agency and take back once again these copies? Probably, you will have to do this. And last question. I could understand something about the activity of Aristarkhov and Rybak, but did the minister Medinsky ever express his attitude to this situation, do you know his position?